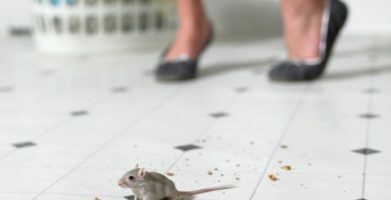 Home / Blog / How do you know if you have a mouse in the house? Mice and rats leave markings around your property that can easily be spotted and fixed if you know where to look and what you are looking for. Rub marks along walls and floor. Mice make paths along walls and leave smudges or smears that are created from the grease on their fur. These paths often run along walls with furniture or hiding spots that mice can disappear behind. Feces. Mice droppings look like dark colored rice or like a little pellet. This may be seen along the paths the mouse has created as well as any places the mouse hangs out. Look for places that provide food sources or shelter. Containers that look as if they have been chewed through by sharp, little teeth. This is most common in cardboard boxes like cereal boxes or rice bags or boxes. Mice will take over anything that may provide food or shelter. Bags or boxes that store clothing may be chewed through because the cloth inside provides great nesting material. Nests. Nests are commonly found in drawers or cupboards. They can be made out of anything that mice can chew through, which is a lot! Clothes, cardboard, hair, the list is never-ending. Storage containers. 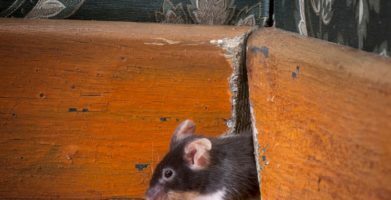 Just like in your house, mice will chew into boxed containers that are used for storage for the material, safety, or food that may be inside. Look for trails and excrement. These may be more difficult to spot than in a house, but can be found anywhere rodents may hide such as corners, behind tool boxes, or around stored items. Damaged interior. Rodents that have made a home out of your vehicle are going to use what they can to make a nest and to eat. Your ceilings, cloth OR leather seats, and carpet will be chewed through. 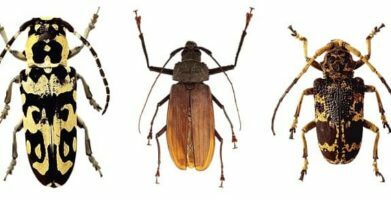 You may find nests made out of the interior in the vehicle’s trunk, body, hood, and even in the center console or glove box. Where there are mice, there are always feces trails. When you see signs of rodents, follow the CDC’s instructions for cleaning up after rodents to prevent the risk of disease. Place Stay Away® pouches in these areas to repel rats and mice in the future. Rub marks along walls and floor. Mice make paths along walls and leave smudges or smears that are created from the grease on their fur. Feces. Mice droppings look like dark colored rice or like a little pellet. This may be seen along the paths the mouse has created as well as any places the mouse hangs out. Look for places that provide food sources or shelter. Containers that look as if they have been chewed through by sharp, little teeth. This is most common in cardboard boxes like cereal boxes or rice bags or boxes. Mice will take over anything that may provide food or shelter. Bags or boxes that store clothing may be chewed through because the cloth inside provides great nesting material. Nests. Nests are commonly found in drawers or cupboards. They can be made out of anything that mice can chew through, which is a lot! Clothes, cardboard, hair, the list is never-ending. Storage containers. Just like in your house, mice will chew into boxed containers that are used for storage for the material, safety, or food that may be inside. Look for trails and excrement. 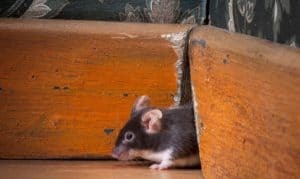 These may be more difficult to spot than in a house, but can be found anywhere rodents may hide such as corners, behind tool boxes, or around stored items. Damaged interior. Rodents that have made a home out of your vehicle are going to use what they can to make a nest and to eat. Your ceilings, cloth OR leather seats, and carpet will be chewed through. You may find nests made out of the interior in the vehicle's trunk, body, hood, and even in the center console or glove box. When you see signs of rodents, follow the CDC's instructions for cleaning up after rodents to prevent the risk of disease. string(49) "How do you know if you have a mouse in the house?"